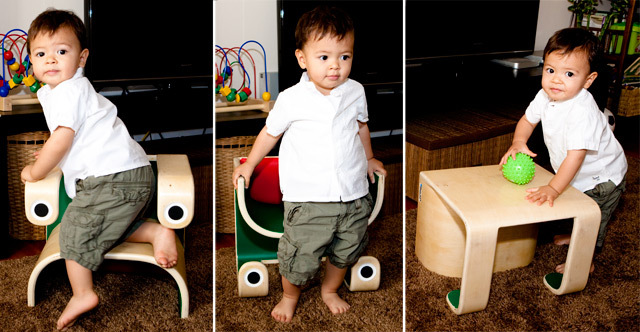 Read, Draw, Play & more on this new multi-functional eco-furniture that quickly & safely adapts to your child's needs and imagination! Hi Kickstarters! Thanks for checking out our project. 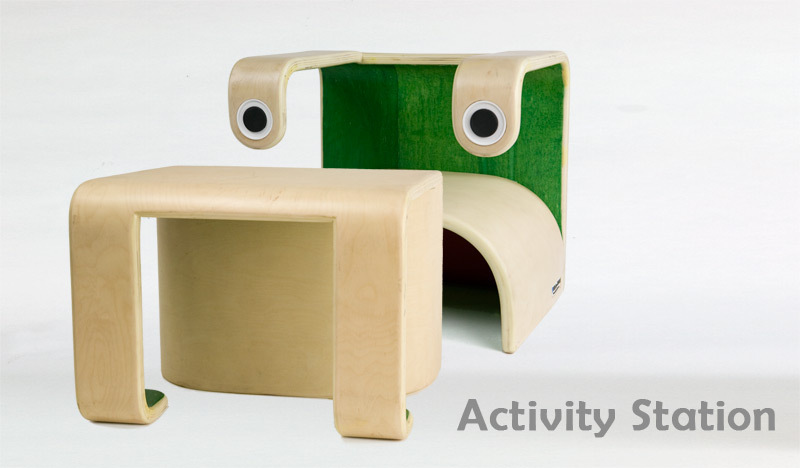 Joe & I (Chadwick) love making cool eco-furniture for kids and are excited to share our project with you! After over a year of planning and working out all the details, we are now excited to share our 3-in-1 little frog with you. Our prices and shipping rates are discounted for all you kickstarters! Our retail prices will be $135 + tax + shipping per little frog after our time here runs out. The Rocker-Rails accessory will be sold separately for $30 + tax + shipping after also. Our 3-in-1 little frogs are stylish space-savers that quickly and safely adapt to your child's needs and active imagination! They come pre-assembled and are hand-crafted with high quality, certified, earth friendly, and kid-safe materials so that every little frog will be around and look great for many years to come. 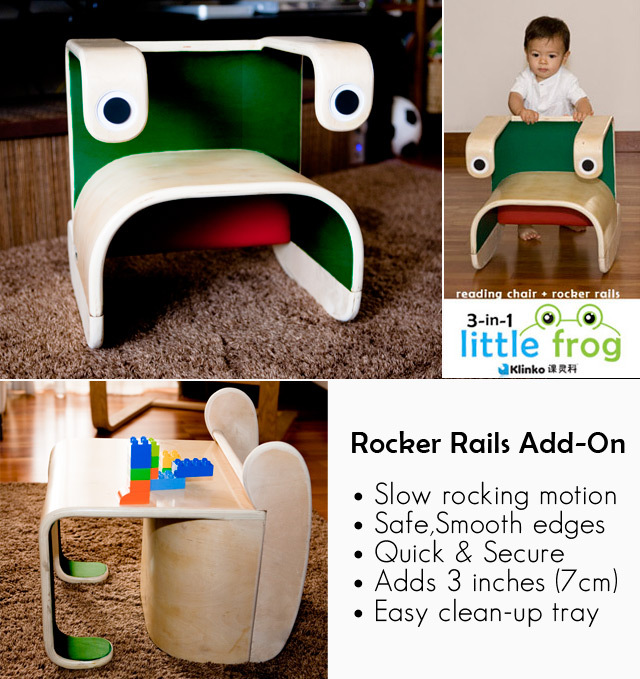 Our safe, 3-in-1 little frogs have a wide base and can be used as a reading chair, a play table, lounge chair, and can also convert into a rocking chair by quickly adding our Rocker-Rails accessory to the unit with 4 supplied machine screws. The Rocker-Rails accessory is designed to add another safe & fun activity to the reading chair position. Plus, it also allowing the unit to "Grow" nearly 3 inches taller (7cm) without interfering with any of the standard 3 functions. Technically, making it a 4-in-1 little frog. One of the subtle, but extremely useful features is our "easy clean-up tray" that is cleverly tucked away. This feature automatically collects pens, pencils, & crayons when the little frog is being switched into the reading chair position. Also, while the little frog is in the table position, you can simply lift up the front a bit and quickly store your drawing tools neatly to the back of the play table. Making it fun and easy to put away pens, pencils & crayons. Mess-Free! 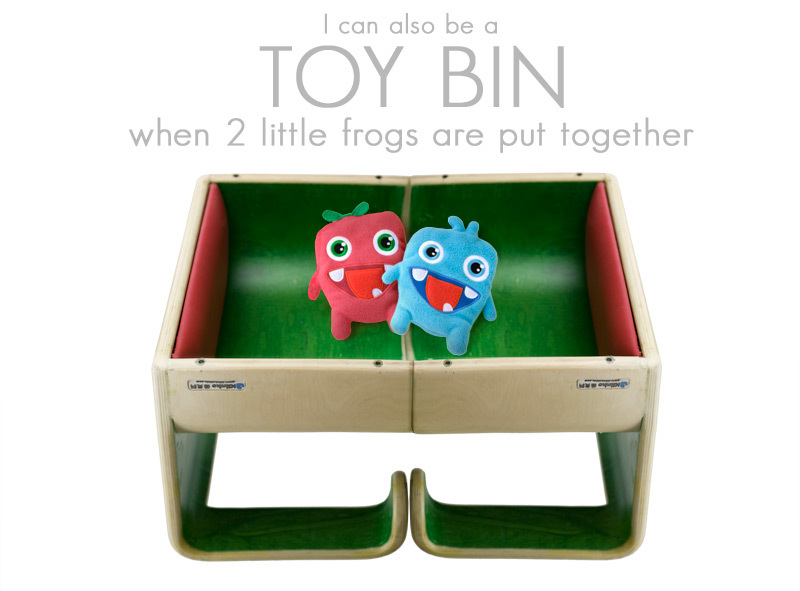 • Slip-resistant, non-marking "frog eyes"
• Toy Bin or Activity Station when 2 little frogs are combined! You Pick! 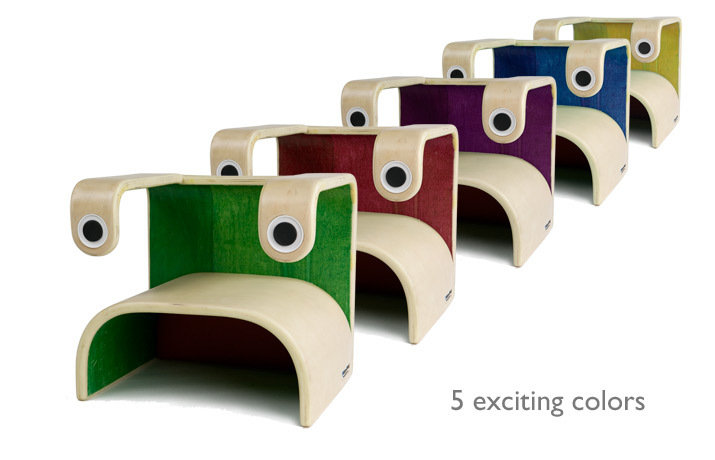 Your 3-in-1 little frog can come in: cherry red, banana yellow,melon green,berry blue, & plum purple. Because we are dealing with natural wood textures, water-based stain, our color shades above will slightly vary from one product to the next. We promise the color you choose will look fantastic. We will send out a survey after the funding is completed and ask you again what color you want and where to send your reward. Our strong little frogs weight only 9lbs & will support up to 160lbs in all positions. The rocker rails accessory weights 1.5 lbs. We like to plan ahead with our designs so we can make new, high quality, and useful products from our "trash"! Our left over / cut-out pieces of wood are recycled & re-purposed into new products that are both stylish and multifunctional. We then give them away for free to NGO's focused on kids & education in rural parts of China. The smaller scrap and saw dust material that we can not built into new furniture is further recycled by a nearby facility. The image below is just one example of what we do. Our 3-in-1 plywood molds are specially made so we can make new products beside the little frogs from them without the need to make new molds. This saves from using more steel, fossil fuels, and energy to make new products. We realize that the more that we can re-purpose our cut-outs, conserve raw materials, electricity, transportation, and fossil fuels the better it is for all of us. We do not use Styrofoam or plastic packing materials, instead we use packaging that is 100% Compost-friendly. We use a virtually paperless production process and we only use our printers when necessary. We are far from perfect, but we constantly work hard to make our carbon footprint as small as possible. 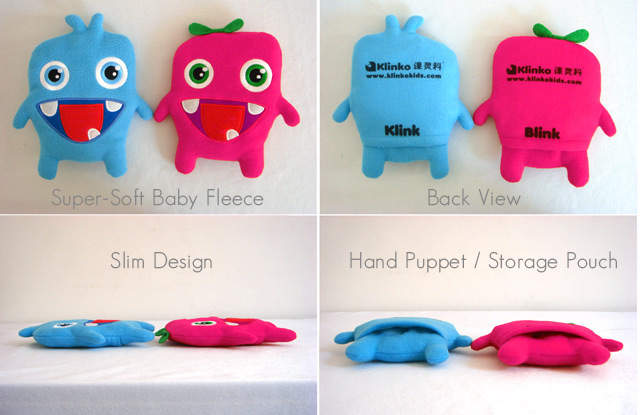 Our cute monster toys "Blink & Klink" are made from certified child safe, baby soft fleece. Our monsters are ready to play, learn, and explore! These little guys also have a "hand-puppet" slot in the back for added play value. They are both around 7.5 inches (19cm) tall and 5 inches (13cm) wide. We plan on making these just for you kickstarters! In 2009, We (Chadwick and Joe) started designing and making original furniture for kids under the name Klinko Kids Furniture. We've worked hard (and lost countless hours of sleep) over the past year to make the 3-in-1 little frog simple in design, but have multiple practical functions. Chadwick does the designing and Joe makes the designs come to life. Our hope is to be a link between a child and their education by providing imagination evoking furniture that kids love using and learning on. Thank you for checking out our project and helping us spreading the word! • Download our presskit & Blog about the little frog! - http://tinyurl.com/klinkopresskit• "Like Us" on Facebook, (klinkokids) & share our video on your wall with your friends. • Tell furniture stores and distributors about us! • You can also send us encouraging messages. You're Awesome. This gets your name on a special place on our website (web-credit) & A Big Thank You for your support. Every dollar helps! 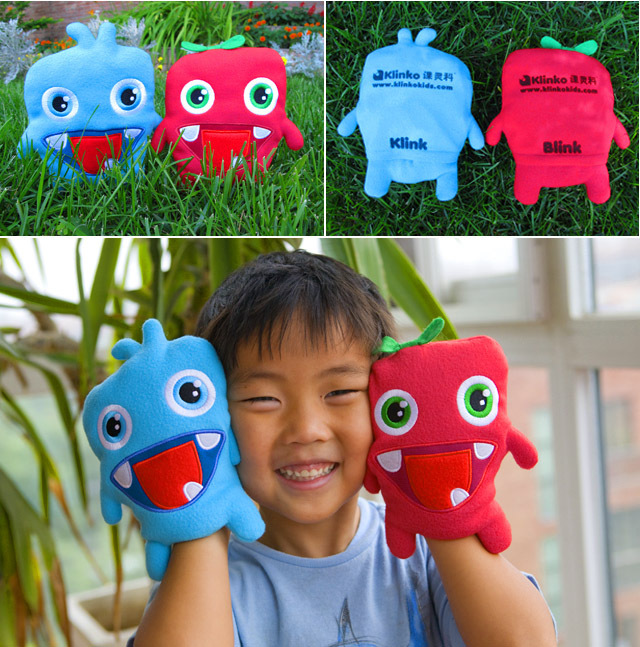 Gets you web-credit + 2- PLUSH MONSTER TOYS (1-Blink & 1-Klink) made from baby-soft fleece & they have a fun Hand-Puppet / Storage Pocket on the back for active imaginations & for storing little treasures. + FREE SHIPPING WORLDWIDE!! 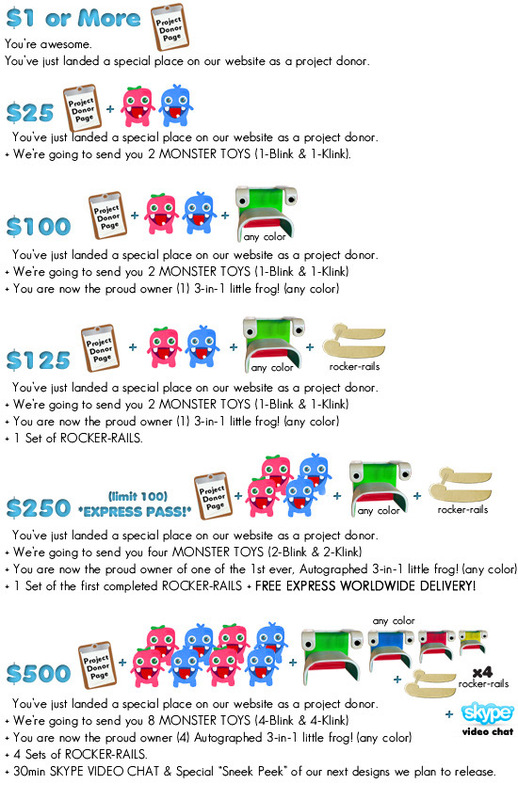 "JUMP 1ST" EXPRESS REWARD: Gets you 1 AUTOGRAPHED LITTLE FROG (any color) + ROCKER RAILS + 4 MONSTER TOYS. No extra waiting, we'll pull the first few finished ones off the production line , package it, and send it to the address of your choice ASAP. You will join a small group of people to have the very first of the 3-in-1 little frogs ever made! Plus FREE EXPRESS DELIVERY WORLDWIDE!! Gets you web-credit + 4 AUTOGRAPHED LITTLE FROGS (any color) + 4 ROCKER RAILS + 8 MONSTER TOYS + 30MIN Skype Video Chat where we will show you a "sneek-peek" of our other new designs we will release next + FREE SHIPPING inside the US & China. International backers please add $80.